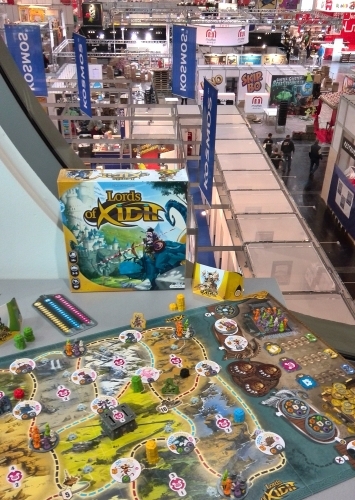 With Essen Spiel 2016 just 10 weeks away, the anticipation is starting to build for the world’s most important annual tabletop game event. While those in the US will want to get GenCon out of the way this month before getting too excited, those of us of a more euro persuasion – both in terms of location and gaming tastes – are already looking towards October. And once again it’s looking like being a landmark year. For the first time there will be more than 1,000 exhibitors at the event. And no, that’s not a typo – 1,000 exhibitors. And over the four days they’re expecting 160,000 people through the turnstiles (which includes the likes of me four times, as you’re counted each day you enter). Having a press pass is great because you don’t have to queue to get in – but unlike an exhibitor pass (which I’ve managed to get before thanks to AEG) it doesn’t get you in early. That has proven invaluable in the past in terms of getting in for demos early, so I will have to be more focused (read: sneaky) this year in terms of getting organised. There’s still a chance I may be able to get one of said passes, as one of my co-designs might make it to the show – but the publisher admitted it was a “very ambitious” target to make it with the time we have left. Having seen some of the early artwork I think it’s going to look amazing, so I’m desperate to see it there – but won’t be holding my breath. At the other end of the game design spectrum, it’s getting to crunch time in terms of getting prototypes ready for showing to publishers – and then arranging the meetings. I can’t believe its only 10 weeks away! Ye gods… Two older games will definitely be there, while two more have the potential to be in good enough shape to show. But for that to happen we’re really going to have to get our houses in order. If I’m honest it has been a slack year for me in terms of design; I just haven’t felt motivated, which hasn’t been helped by the slow progress of other games that are already with publishers. I need to shake that off – and hopefully the thrill ride that is Essen will help me get over this malaise. Then of course there’s the fun of trying to grab the games I want most from publishers without having to buy them! With almost 100 game reviews to my name now, and having kept all my reviewing promises from last year, I’m hoping this will be a little easier in 2016. But to be honest I enjoy the challenge of bartering, so bring it on publishers! And finally, of course, I’ll be there as a punter; as a gamer (and as a drinker). It’s the world’s best board game shop for one week a year and it was open for eight days rather than four I’d still be heading in every day. I may not love the smell of gamers in the morning, but I do love the games themselves a possibly unhealthy amount. So all my trains are booked and the hotel is confirmed, but that’s just the tip of the iceberg in terms of preparing for Essen. But before then I’ve got about 10 other games sitting on the shelf I need to review. And there are those prototypes to work on. And those publisher meetings to organise. Can it really only be 10 weeks to go…? This entry was posted in Board games, Essen, Game design, Games, Travel by Chris Marling. Bookmark the permalink. Chris, I would also be happy to team up with you for the demos, particularly on the Friday. I will be attending on my own this year, and I am quite worried about finding demos solo. A group of three to four is ideal. Definitely contact me if you need a partner!